Oh Victoria Beckham you are such a wag, not just in terms of being married to a footballer but also in terms of being a highly droll person. Just this week the fashion designer said that thanks to social networking, the public are finally getting to know her sense of humour. 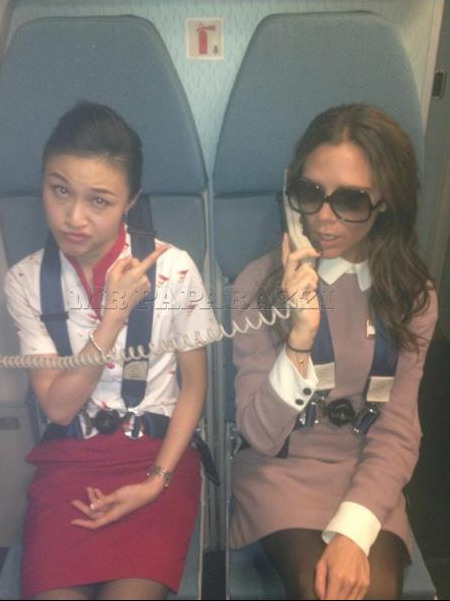 So, proving her own point, Victoria posted an image of herself pretending to be a flight attendant en route to China today. Sorry, excuse us while we catch our breath from laughing so much. Yup we really got to see the real her, immaculately dressed to the nines in a special seat on the plan, what a fascinating insight.